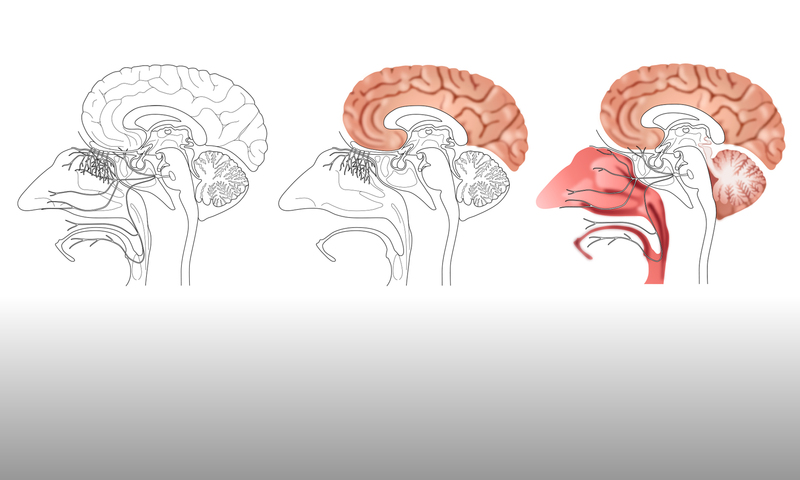 One of the visual elements that will be required for the upcoming review paper is an image showing the pathway from the nasal cavity to the brain. Therefore, Gill wanted to produce a broadly anatomical image of the human head that could then be used as a background for additional annotation, to show the possible pathways. Using an anatomical model as the reference image for the Illustrator drawing (shown below) gave a necessarily simplified representation of the human head. This simplified representation made it easier for Gill to make the drawing as a series of separate elements, which fit together like the pieces of a jigsaw. This is in contrast to the completely anatomical image of the human brain (described in this blog post) where many of the elements overlapped, or were dependent on the presence of elements in other Illustrator layers, in order to create the correct final image. Creating this ‘jigsaw’ image then made it straightforward to remove elements, change their appearance, or swap in coloured, or more anatomical, versions of selected elements. Additional elements or annotation could also be added. For example, it could be useful to overlay representations of the olfactory or trigeminal nerves. Some variations of the anatomical head are shown below. This approach could be used for any figures that need to represent anatomical elements, but where a simplified or more diagrammatic representation of the anatomy is sufficient. A baseline image could contain all of the anatomical elements, or elements could be supplied as separate files, and they could then be removed, added, edited or customised to give the required image. Creating the baseline images so that they can work like a jigsaw does take some time and effort, but the flexibility that this approach provides should make the effort worthwhile. It would also help the department produce more consistent conceptual figures, in terms of their appearance, if the same baseline images are being used as starting points for different conceptual figures. The possibilities of using these kind of images will be discussed in the upcoming workshops. Gill will continue to experiment with this approach for other images, starting with the hypothalamus and pituitary gland in humans, followed by the nasal cavity and brain of rats.